Good morning from the swamps of Jersey. It's going to be a long day for us media types who drove down this morning and are heading back after the game. Fortunately, the drive down from New Haven was a breeze. Made it here in about an hour and 40 minutes, with colleague Dave Solomon as my navigator. Dave grew up in the Bronx, has been covering New York pro sports since the 70s and knows every possible route through the city like the back of his hand. He'll even provide advice like, "you want to get to the left lane here because there's a nasty dip in the road coming up." Find a GPS system with that kind of knowledge. Of course, Dave needs a little help closing doors securely. Around the time we crossed the New York border, the trunk of my car flew open. I guess it was a little loose after Dave put his computer bag in and didn't slam it shut, and finally jarred open. 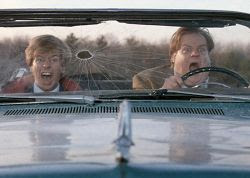 Had it been the hood, we would have reenacted the scene from "Tommy Boy" when Chris Farley forgot to remove the can after changing the oil. Luckily, we were right near a rest stop, so nothing came flying out of the trunk. We'll check back for any breaking pregame news.